Here is a quick, easy and very tasty condiment that would be great as a grilled steak or burger topping. 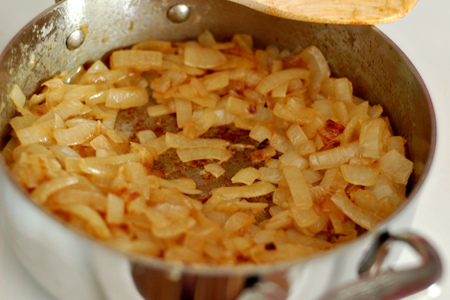 I am going to use it to make what I hope will be a stellar appetizer, but you can use it as a ready-made alternative to sauteed or caramelized onions. Despite the name, this is most definitely savory rather than sweet. 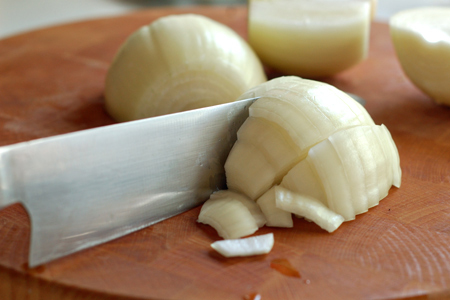 Peel the onions then cut them in half from pole to pole. Cut the halves into half-rings, keeping them together, then cut the half-rings into thirds. You should have about 3 1/2 cups. Melt the butter in a medium sauce pan over medium-high heat. 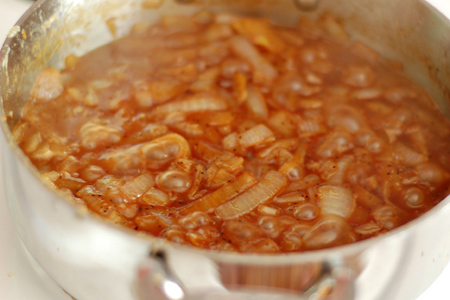 Add the onions and cook them, stirring frequently, until they are just translucent (about five minutes). 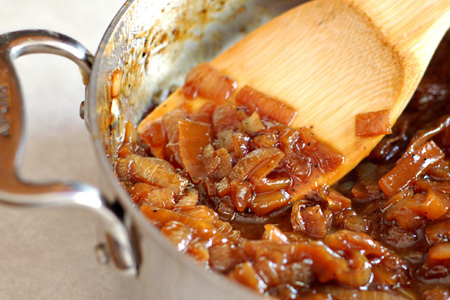 Reduce the heat to medium, sprinkle the onions with the sugar and continue to cook them, stirring frequently, until they are just starting to brown (about five minutes). Add the remaining ingredients and bring just barely to a boil. Continue to cook, stirring frequently, until about 3/4 of the liquid has evaporated (about 8 minutes). Reduce the heat to low, cover and cook another 10 minutes. Remove from the heat, uncover and let cool. Put the cooled marmalade in jars and refrigerate. It should easily keep for a week or two. Wow, this looks wonderful! I love that it keeps in the fridge so I don't have to caramelize onions every time I want them. Those look yummy & awesome - do you think i could substitute Balsamic Vinegar for the red wine? I'm confused, you put this on your hotdog cold? Cuz I love grilled onions and nothing says summer to me than a grilled dog with onions. Is it more like a relish then? I made it and liked it, but it *is* vinegary. However, that is mitigated by the sugar somewhat. What I found missing was salty. I added about 1/2 tbs. of fine sea salt, which seems to make a nice trio then of salt/sweet/sour. Just my 2 cents. Really enjoy the blog! Thanks for the feedback, Kathryn. Vinegar is a somewhat touchy thing to gauge. If you find it too much so, just add more sugar and/or molasses. Looks like an excellent marmalade. Thanks for sharing this idea. 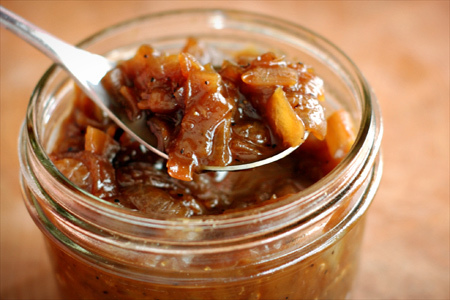 This onion marmalade sounds so good! 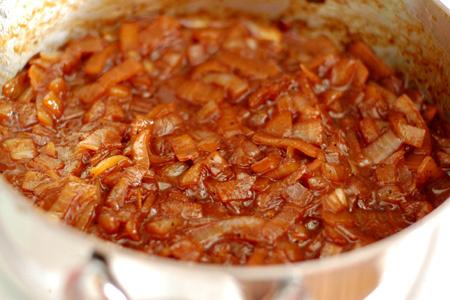 You know, I love onion marmalade but to be honest, I've never made it. So glad I stumbled on your post! Sounds yummy. I bet it would also be great as an appetizer on top of sliced baguette with some goat cheese. Great idea, Dawn. Try it sometime and let me know.